Arabic uses a definite article in العراق (al 'Iraq), just as it does in al Kuwayt and al Jaza'iriyah. But it has never been usual in English, even though we effectively do use one when we don't say Geria. The Bahamas and The Gambia are the only country names in which the definite article is compulsory. The governments of (the) Netherlands and (the) Philippines are inconsistent in whether or not they use one when speaking English; current Dutch policy tends towards not. Prefixing the definite article to Ukraine is just wrong, and Ukrainians find it offensive. Richard Osman is among those who will please note. Woodsman pointed out the other day that the Guardian's house style is to write the Bahamas and not The Bahamas. He thought that was bad form. If it's current Dutch policy to call the Netherlands 'Netherlands', then it should make sense to turn it into a singular: Netherland. Why would they go along with a wrong plural that was historically correct long time ago, but no longer? The governments of (the) Netherlands and (the) Philippines are inconsistent in whether or not they use one when speaking English; current Dutch policy tends towards not. English is nothing to go by. In English lovely old names may be outdated or wrong. In Netherlandish the country is one land, and this land isn't Holland. In German it was Der Iran and Der Irak until around the time of Desert Storm. I guess the articles just went west in the middle of all the excitement and weird non-native speaker war correspondents no one had ever heard of. In German it's also Die Schweiz, which is of course an issue English circumnavigates by adding the -land designator, but to restore balance Gambia comes without the article. The Netherlands, Bahamas and Philippines all come with the plural article, die. I'll have to get used again to lower-case English, French, March, April, North, West, etc etc. Only proper nouns begin with capital letters. By now, Netherlands is almost singular in English, and I expect that over time it will become rare to consider it a plural. That it ends in -s which usually denotes a plural will cease to matter. After all, Vlaanderen is even considered singular in Dutch by now - although Flandres is still considered plural in French. It seems that there is no hard and fast (no sniggering in Oxford! ) rule about this, different countries/languages treat things differently. If we are not carefull, we will end up with dozens of examples of each and no clear conclusion to draw. The territories are integral parts of the French Republic. Additionally French Polynesia and the Wallis and Futuna Islands are Overseas Collectives in Oceania, St Pierre and Miquelon in North America and St Martin and St Barts (Barthelemy) in the Caribbean; all considered integral parts of the French Republic. The French Southern and Antarctic Islands in Antarctica could arguably nudge the total to seven for France = Europe, South America, Caribbean, Africa, Oceania, North America and Antarctica. Is it OK to say e.g. "of Netherlands and Philippines"? To me, that's wrong. It only seems wrong because it's not what you're used to. When our parents were young people it was usual to say "the Lebanon", "the Sudan", and "the Argentine". By now, those forms feel a bit quaint - and it may be that in a century from now, "the Netherlands" will feel equally quaint. For more country names in which the definite article is compulsory, how about The Republic of the Congo and The Democratic Republic of the Congo? Zaire is wrong because that's not its name any more; just Congo fails to distinguish, so you need the full name, article and all. My preferred solution is to refer to the two countries as Congo (Brazzaville) and Congo (Kinshasa), and some international organizations do it that way. It's really a bit daft for two countries to have essentially the same name, and we can only hope that one or both will adopt something different at some point. That's largely why Zaïre was adopted in the first place, and the name only reverted so that the country could dissociate itself from a deposed government. Vaguely comparably, it doesn't feel quite right to say Czech Republic without a definite article. Czechs don't find this odd in the same way since their language doesn't have the definite article, but they do find Česká Republika inconveniently long. For which reason, they actually say Česko most of the time, and the current government there is keen to make this the official short form name of the country. The English equivalent is Czechia, which the country is increasingly using in its dealings with the rest of the world. Since 2010, from a geological point of view, the Netherlands can be found in North America (Saba, Sint Eustatius), South America (Bonaire) and Europe. Four continents, but only if Asian carbon copies in other countries are allowed. There's Huis ten Bosch in Japan, and the Dafeng Holland Flower Park in China. 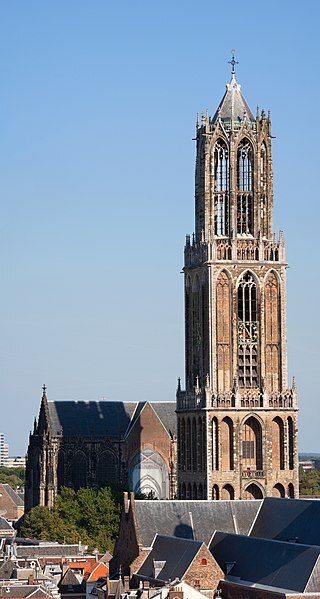 Utrecht's Dom Tower. The best clue is the Japanese hill in the background.